I know Christmas is still two months away but a couple of weeks ago I was thinking about a simple-to-make something for the knitting ladies and other friends. 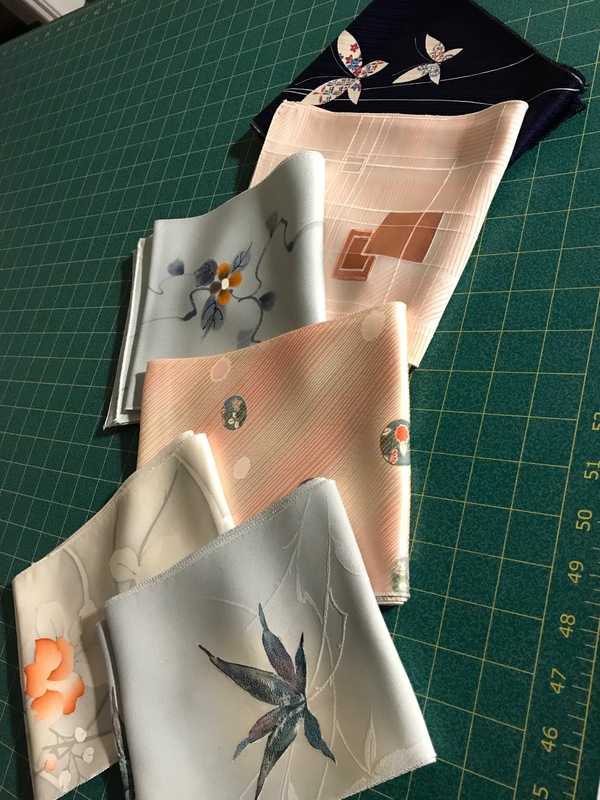 I was looking at Ann Williamson‘s blog – she does beautiful garments and accessories using kimono silk which she buys from Ichiroya in Japan. She had some lovely pieced scarves in her shop – I remembered the kimono silk fabric I bought a couple of years ago. I have nothing specific in mind for the fabric – a while ago I attempted a simple silk jacket but it didn’t turn out well and I tossed it. I decided to use some from each bolt to make silk scarves. This project isn’t meant to create an expensive, elaborate gift like Ann’s scarves are – just something simple, yet useful. Last year it was shoe bags, the year before zippered bags. Two weeks ago I cut 5′ lengths from each bolt – kimono bolts are 14″ wide by 10-12 yards in length. I split each length down the centre to give me two 7″ scarves. Yesterday I set up my serger to stitch a narrow rolled hem and got to work – I did ten scarves. Today I completed the second batch of ten. The scarves are long enough to wrap around my neck twice and tie in a loose overhand knot in the front. The silk is soft and smooth and will be warm to fill the neck of a winter coat. I’m pleased with how they turned out. My next step is to figure out how to make “envelopes” using parchment paper as wrapping for each scarf.